"Hard Times at Douglas High: A “No Child Left Behind” Report Card" (112 min) is an important new documentary from HBO Films (Picturehouse would handle any theatrical showings). The HBO link is this. The film presents daily life for students, teachers and administrators at an inner city school in Baltimore, MD. That school is Frederick Douglas High School. The year is 2005. The film focuses on “live action” style of documentation, with not that much narration. The film tells us early that the school has failed to meet the norms of Adequate Yearly Progress as specified by the federal “No Child Left Behind” law passed in 2002. A minority of students pass sate exams (HSA Standardized Assessment Tests in Maryland, they would be called SOL’s in Virginia) in English, math, and other subjects. HAS’s are not required for graduation until 2009, and some students do not attempt the test beyond signing their names. The school has only 83% attendance, when 90% is required. A typical ninth grade class has 500 students. By senior year, only about 180 students are left. The film shows many classroom scenes. One particular English teacher, Mr. McDermott, seems to be effective in class as the film shows him. He is a young Caucasian male in a school that is almost entirely African American, effectively segregated de facto. However, he tells the filmmaker that he is overwhelmed by discipline issues despite careful lesson planning. He resigns after one semester. The school hires a graduate student (in social work and education) as a long term sub for his class. The graduate student, African American, has no classroom teaching and finds he must learn to bond with low income teens. The film goes on to say that 66% of the teachers are uncertified, and many are subs (including long term subs). The principal (Isabelle Grant) is shown disciplining students. Bathroom doors are locked during class. Sometimes students are required to attend remedial and Saturday classes. Near the end of the film, the graduation is shown. Many students do not graduate, and many who do graduate do not have parents to attend. The English scores rose from 10 to 25% and math from 1% to 10%. There was a battle over restructuring the school because it still did not make adequate yearly progress. Finally much of the administration was replaced and a local university was involved in helping with the ninth grade problem. Visitors know that I was a substitute teacher in northern Virginia from 2004 to 2007. I have discussed the problems on a couple other blogs. For example, this link explains much of it, and the label provides related entries. Visitors may want to compare this film to "Freedom Writers" (2007, dir. Richard La Gravanese, Paramount / MTV), about Los Angeles inner city teacher Erin Gruwell (Hilary Swank) who has her students write journals that get published in a book; my review is on an older site here. Picture: Department of Education Building on Independence Ave in Washington DC. 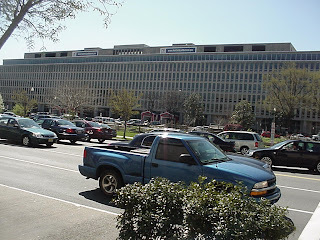 Note the NCLB banner on the building (2005).